In this information age, most people have voluminous access to information about raising pets. The problem is the accuracy of these sources and the need to search many sources to obtain a complete picture of the subject at hand. The dog, Canis lupus familiaris, is the most genetic diverse of all domestic animals with over 300 breeds recognized worldwide. Author Ross D. Clark, DVM has studied the genetic diversity of the purebred dog for over 50 years as a practitioner, lecturer and researcher, being one of the first (1982) to annotate the different traits, behavioral characteristics and medical conditions of the purebred dog. In his latest book release, Clark identifies the predisposed health syndromes of 28 American Kennel Club recognized working breeds. 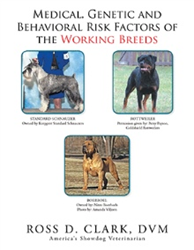 “Medical, Genetic and Behavioral Risk Factors of the Working Breeds” (published by Xlibris) not only describes the normal and positive attributes of each working breed but lists recognized medical problems of each breed as well as unique behavioral traits and information on breeding and growth. Unlike other dog books, the author feels that his book contains a more comprehensive approach in understanding both medical and non-medical characteristics that are special for each working breed. Clark’s book can be read by the pet owner, the practicing veterinarian, researchers and potential breeders. Each chapter contains color illustrations and an extensive list of references, making Clark’s book important, interesting and authoritative. Ross D. Clark, DVM is the founder of Woodland PetCare Centers and a co-founder of National PetCare Centers. He received his doctor of veterinary medicine degree in 1963 from Kansas State University. In addition to the 200-plus books, Clark has written about all AKC and CFA breed of dogs and cats. He has also written four books on practice management for veterinary hospital teams. Clark is currently owner and/or managing partner of five small animal hospitals and pet resorts in Oklahoma. He is married to wife Linda who is also an AKC licensed dog judge. Along with the multiple dogs and cats, they have two children, twins Kent and Kimberly, and two grandchildren Kash and Brieze Clark.